CINCINNATI -- Anoki is looking for love but doesn't have any dating options. 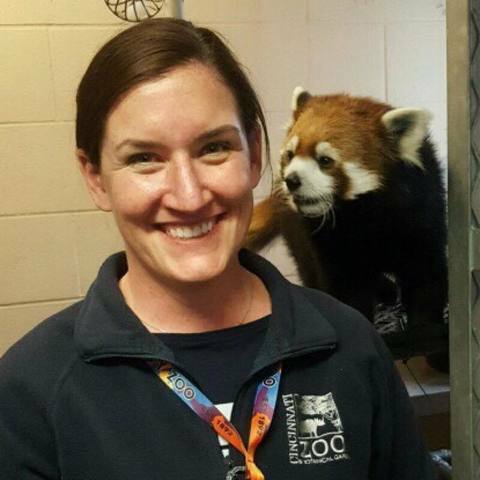 Tinder or Match.com won't do her any good, but she's found the perfect matchmaker for her situation -- the Cincinnati Zoo Center for Conservation and Research of Endangered Wildlife (CREW) . The Maryland Zoo earlier this year teamed up with CREW to perform artificial insemination on their 21-year-old female polar bear, Anoki . CREW used frozen sperm from Hudson, a male polar bear from the Brookfield Zoo in Chicago. The group decided to intervene after Anoki’s lost her mate Magnet before she could successfully breed and produce cubs. Among the North American population, Curry said the female polar bears of reproductive age far outnumber the males, presenting a complicated dilemma in zoos. With fewer cubs being born in captivity coupled with the shortage of males, Curry said they began banking sperm from viable candidates to address the need for assisted fertilization in the future. “We want animals breeding naturally but when there aren’t enough males around we’re sort of left to resort to those techniques,” she said. In order to find the ideal genetic match for Anoki, Curry said she contacted the Species Survival Plan (SSP) which acts as the ultimate Match.com for animals. After reviewing multiple cryogenically frozen sperm samples stored at CREW, she said the SSP selected Hudson. While all went well with the procedure, Curry said performing artificial insemination on polar bears is still in the early stages with only 12 attempts to date. In addition to Anoki, Curry performed A.I. on the Cincinnati Zoo’s former female polar bear Berit, now residing at Henry Vilas Zoo in Madison as part of the three-way polar bear swap . While they’re hopeful one or both of the females will produce cubs, she said they’ll just have to wait and see as pregnancy in polar bears is extremely difficult to verify. In addition to multiple pseudo pregnancies, polar bears have delayed embryo implantation where it may take anywhere from five to 10 months for the female to give birth. Curry explained the embryo usually implants to the uterine wall when all conditions are ideal, including food, shelter and climate. In terms of the Cincinnati Zoo’s own bears -- Anana and Little One -- Curry said the pair didn’t mate last year, but they’re hopeful nature will take its course in the spring. In the past, Anana gave birth to cubs with another mate, but Little One has yet to become a dad. As a male, Curry said Little One is extremely genetically valuable, so they’ll give the bears ample opportunities to take care of business on their own before intervening. However, even though a pair seems to be on the right track, it’s not always a sure thing. During the past few years Berit and Little One mated but failed to produce cubs -- a common problem at zoos, Curry said. As part of ongoing research, Curry said CREW is working to design a pregnancy test for polar bears as well as other carnivores. Funding for the Polar Bear Signature Project comes as part the Polar Bear Challenge going on from now until Dec. 31, said CREW’s development manager Amy Fecker. She said the goal this year is to raise $70,000 through donations and events. While other polar bear challenges have folks diving into icy waters, she said they’re looking along the lines of something far less frigid.